One of the top requests I get from readers is how to save money fast. So I thought I’d write a comprehensive post on ways to save money fast so you can put money in the bank right now, without having to do a lot of work to make those savings happen. 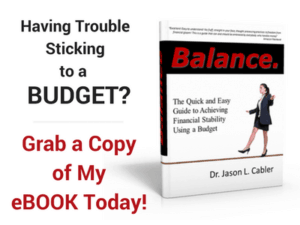 I’ve also included some great resources along with these tips so you can save money fast and get your finances on the right track for good! Sometimes it can be hard to save money for the things you need and want in life. Saving money for things like retirement, college, an emergency fund, or a car can be difficult for anyone. But when you know these wonderfully effective tips for saving money fast, you can be ahead of the game compared to most people, and save more money than you ever thought you could! When you’re shopping online, Ebates is a great way to save money fast. Once you sign up (and earn a free $10 signup bonus), all you have to do is visit Ebates.com anytime you shop online. Ebates has agreements with over 1,800 online stores (including Amazon, Kohls, Walmart, Target, and others). Every time you make a purchase, Ebates gets a referral fee, and they share part of that fee with you. 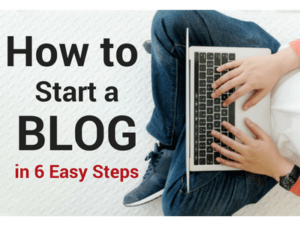 You can earn hundreds of dollars over time, especially if you do much of your shopping online. Just Click the button below to join Ebates now- It's easy and free! Similar to using Ebates, the WalMart app can also help you save money fast. Of course, WalMart is known for it’s low prices. Their low price guarantee can work in your favor to earn money for you! All you have to do is download the WalMart App to your mobile device to get started. Then, every time you shop at WalMart, use the Savings Catcher feature inside the app to scan your receipt. WalMart will compare prices on the items you purchased with other retailers in the area. If another retailer has a lower price, WalMart will refund the difference to you. As you save money within the app, you can cash it in for a WalMart gift card and spend your savings as you choose! When you do eat out, there is a great way to save money fast on restaurant food! Restaurant.com is an awesome site that allows you to purchase $25 gift certificates to local restaurants for only $10! Sometimes they will even alert you to special deals that allow you to buy even cheaper! I’ve used Restaurant.com to save money on meals many times at some very nice restaurants over the years. I always had a great experience! Sign up for Restaurant.com for free! When we moved into our current home about 10 years ago, I made sure all our bulbs were CFL (Compact Fluorescent) bulbs. Even though our new house was about 70% larger than our previous home, our light bill actually went down! A CFL uses about 25% as much energy as an incandescent bulb, so you can save money quickly by installing these in your home. These days, I’m converting all our CFL’s to LED lights to save even more money. An LED bulb uses about 10% of the energy of an incandescent, and about half that of a CFL. Also, CFL’s and LED’s last a lot longer than traditional incandescent bulbs. They do a great job at saving you a ton of money on bulb replacement, making the cost savings even greater! About 3 years ago I bought two programmable Nest Thermostats for our home, which saves us about 10% on our monthly heating/cooling bill. The Nest thermostat is awesome because it helps you save money fast as soon as you install it (installation is very simple). It actually learns your routine and adjusts the temp to save energy when you're away from home. When you return home, its sensors detect your presence and automatically adjust the temp back to normal. Also, a great feature of the Nest is that you can control it using your smartphone or other mobile device to set up a schedule, set temps for maximum efficiency, and control other features too numerous to mention. Our Nest thermostats more than paid for themselves in the first year! Planning your meals ahead of time allows you to buy groceries more efficiently and save money fast by avoiding unplanned stops at your local fast food joint. Planning your meals can also help you eat more healthy too! My friend Lauren Greutman at IamThatLady.com is an expert on saving money with meal planning. She can show you everything you need to do your meal planning right! You can get Lauren’s free meal planning workbook here. You may be paying too much property tax if you own a home. Some experts estimate that 50% of homeowners are paying too much! Call your county tax assessor to request a reassessment that could potentially lower your property taxes. One thing to keep in mind though, if home prices in your area have risen substantially over the last few years, your taxes could actually go up. I’ve been accused many times of being cheap, and that’s the furthest thing from the truth. Truth is, I spend my money very carefully. I only buy things I can afford to pay for with cash, and when I do, I buy the best possible quality I can afford. Whether it’s cars, clothes, food, or anything else, my goal is to buy the item that will last the longest and work the best, even if it costs a little more. Buying high quality stuff doesn’t always save money fast, but it will save money nonetheless. Everybody knows (or should know) that a great way to save money fast is to shop the after holiday sales. These are when some of the biggest discounts of the year happen on almost everything. You should especially pay attention to the sales if you’re buying holiday specific items. Buying a Christmas tree or Christmas lights just after Christmas can get you as much as 90% off retail! Same thing goes for Halloween, Valentine’s Day, and Thanksgiving items too! New cars depreciate by as much as 30-35% in the first year. Why watch your new car lose a ton of value as soon as you drive it off the lot? Let someone else take that hit and buy used cars only. I’ve been buying used cars exclusively for many years, and I believe it is by far the best way to save money fast when buying a car. By the way, I also pay cash for all my cars. Financing a car costs a lot of extra money that’s wasted on interest and fees. Don’t think you can pay cash for your next car? Think again, here’s how to do it. Not sure if you should fix your car or just get a new one? Read this. These days, having a landline phone is pretty much useless. Getting rid of your landline can help you save money fast by as much as $30-$100 every single month! However, if you have a wired security system or don’t get good cell reception at home, this one might not work for you. Even though I have a six figure income, I’m not too proud to buy some of my clothes at the thrift store. In fact, some of my best high end clothing items have come from my local Goodwill store! Sure, you’ll have to do a little searching to find the good stuff, but it’s worth it to get a $100 shirt for $4! Many times you’ll find clothing that’s never been worn, with the tags still on it! Why buy new when you can save money fast and pay a fraction of what you would pay in a retail store? If you’re an avid reader, there’s no need to clutter up your house and empty your bank account buying books. Get your favorite books from your local library and save your money for something else! If you know someone who has a Kindle, you can even borrow books from them for a short period of time to read on your own Kindle. It’s never good to pay more than you should on insurance. A sure way to save money fast is to do an insurance review once a year. Compare the rates you’re paying for car insurance, homeowner’s, medical insurance and others to make sure you’re always getting the best deal. Learning to avoid instant gratification is very important when it comes to saving money. Be disciplined enough to wait 30 days to decide whether or not to make a substantial purchase (a few hundred dollars or more). Many times, after 30 days have passed, you’ll discover you didn’t necessarily need that item you thought you really wanted. If you’re on the fence about a purchase, waiting 30 days will give you a better perspective. Inviting friends over for dinner instead of meeting them at a restaurant is a great way to save money fast. Instead of going out, have everyone bring a dish and enjoy a game night or watch a movie. That way, everybody saves money and has a blast at the same time! Drinking water has plenty of health benefits. But did you know drinking water can save a lot of money too? Drinking a glass of water before a meal causes you to eat less, so you save money on food and consume less calories. Also, if you’re at a restaurant, drinking water will save you a few bucks on your bill instead of ordering soda or alcohol. If you drink a lot of soda or sports drinks at home, it can also save money on your grocery bill (and dental bills too, by the way!). If you smoke, I’m sure you realize that smoking is expensive. Not only do the cigarettes cost a lot, but the health costs associated with smoking are an indirect cost that will slowly bleed you dry. If you want to add quality years to your life and save money fast, the best thing you can do is stop smoking altogether. You can decide to quit cold turkey or try hypnosis, nicotine patches, Chantix, or some other method for quitting. Whichever one you choose, your body (and your wallet) will thank you. Changing the air filter on your HVAC every month is an excellent way to save money fast on your electric and/or gas bill. Most people don’t change their filter regularly, causing the unit to run harder and longer. Keeping a clean filter in your HVAC saves money every single month and keeps you more comfortable too! 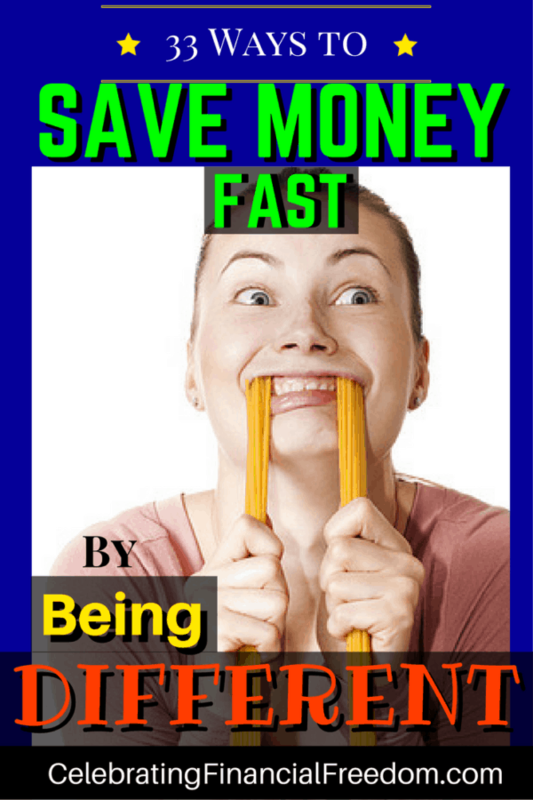 Any time I write about how to save money fast, this one will always be on the list! I know I harp on this a lot, but credit cards are absolutely the worst thing you can use to finance your life. Most people who use credit cards carry a balance. That means they spend hundreds (or even thousands) of extra dollars every year on interest and fees. If you really want to save money fast, get rid of them! Here are some of my articles on credit cards that can help with that. Most of us go to the same grocery store every time we shop because it’s a habit. But have you compared prices with the other grocery stores in your area? You might be shocked at what you find! Fortunately, there’s a great way to find the most affordable store in your area. Just keep a log of the 20 or 30 things you buy most often, then shop for these items at a different supermarket every week, comparing the total price of those items each time. Eventually you’ll find out which store is the cheapest, allowing you to save money fast every single time you go to the grocery store! Shopping with your emotions will get you into huge trouble financially. Don’t shop when you’re depressed, hungry, or lonely. Be careful to understand what emotional triggers cause you to overspend and avoid them like the plague. Eliminating emotional spending from your life will help you save money fast and keep you from going into debt trying to make yourself happy. Life insurance is not an investment. If you’re stuck in an expensive whole life policy, you can save money fast by buying term life insurance for about 10% of the cost of whole life. Use the difference in cost to put into investments or get out of debt. Universal and whole life insurance policies are way more expensive and are terrible investments. In almost every case, you’ll do better with a cheaper term life policy that leaves more money in your pocket. Did you know you can rent a room (or your entire home) using AirBnB? Using AirBnB to rent your property to others can be a great way to save money fast by making extra money. This is certainly not for everybody, but if you wouldn’t mind having a stranger in your home and paying you money for the privilege to be there, then AirBnB might be a good fit for you. Mary, one of my staff members has been renting out a bedroom in her home for a few months now for $100 a night and has had a great experience making several hundred dollars a month! I wrote a post on how to make money with AirBnB that shows everything you need to get started. This is an easy one. Instead of going out to lunch and paying $8-$15 dollars every day for restaurant food, take your lunch to work. As I said before, I make a six figure income, but I’m definitely not too proud to bring my lunch to work. I’ve been brown bagging it almost every day for 25 years now! It’s easy to save money fast when you don’t have to spend restaurant prices on lunch every day! Depending on your skills, when something breaks you should try to fix it instead of trashing it. If a button falls off your shirt, sew it back on; anyone can do that, it’s not rocket science! If you have house repairs that need to be done, find a video on YouTube that shows you how to fix it yourself. Many times you’ll be surprised at how easy some repairs are. Almost every town has a park or greenway you can use to take a walk, enjoy nature, have a picnic, or ride a bike. Those facilities are there for your enjoyment but are often ignored in favor of paid activities like going to movies or concerts. You can also save money fast by checking out your town’s local events calendar. You will be surprised at how many free activities you can find in your area, some of them even better than activities you would pay good money for. Dude, tires are expensive! I’ve bought two sets of tires in the last 3 months! One of the best things you can do to save money on tires for your car is to keep them balanced and rotated on a regular basis. Keeping your tires balanced and rotated allows your tires to wear evenly and last as long as possible. If you don’t, your tires could wear out in half the time, costing you more money to stay on the road. Growing your own vegetables in a small garden can be a great way to save money by reducing your grocery bill. Gardening is also a good way to relieve stress, get some exercise, and keep yourself occupied. It may not necessarily save money fast, but your wallet will appreciate it when you go to the grocery store! Plus, there is just something satisfying about eating something you grew yourself! How nice would it be to leave the frustrations of sitting in traffic behind and let somebody else worry about it for a change? If your city has a good public transport system, you can save money fast by taking the bus or train instead of fighting traffic to and from work every day. Public transport is usually much cheaper than paying for gas, especially if you have a long commute. This one is my specialty! The more debt you have, the more money you’re wasting paying interest and fees for the privilege of using someone else’s money to fund your life. Getting out of debt is the best thing you can do to save money and stop having to live paycheck to paycheck. 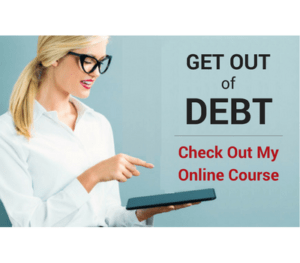 Paying down debt allows you to save money fast by incrementally reducing the debt, thereby reducing interest payments too, until you achieve complete debt freedom. If you want to save money fast, then slow down! Driving too fast causes you to burn more fuel, thus costing you more money. Also, you’re much more likely to get a ticket which is not cheap. If you end up getting a ticket, then your insurance premiums go up substantially. To use your money in the most efficient way possible, use coupons in addition to published sales. Keep tabs on when your favorite store is having a sale, then search the internet for coupons that will get you an additional discount (or use the CFF coupon database!). Case in point, I went shopping for clothes the day after Christmas when the best sales of the year were happening. Everything in the store was 20-50% off. I had my daughter search for coupons, and I ended up getting an additional 20% off! I was able to save money fast just by buying at the right time and using a coupon that was readily available! Saving money is really not that hard most of the time. Sometimes it just means you have to be a little different. Learn to think outside the box if you want to get the job done. Don’t be broke and living paycheck to paycheck like everybody else. Use all the money you save to live better, save more, and succeed with money like you never have before! Thanks for the list! The wait 30 days to avoid an impulse purchase could not be more true for most people..